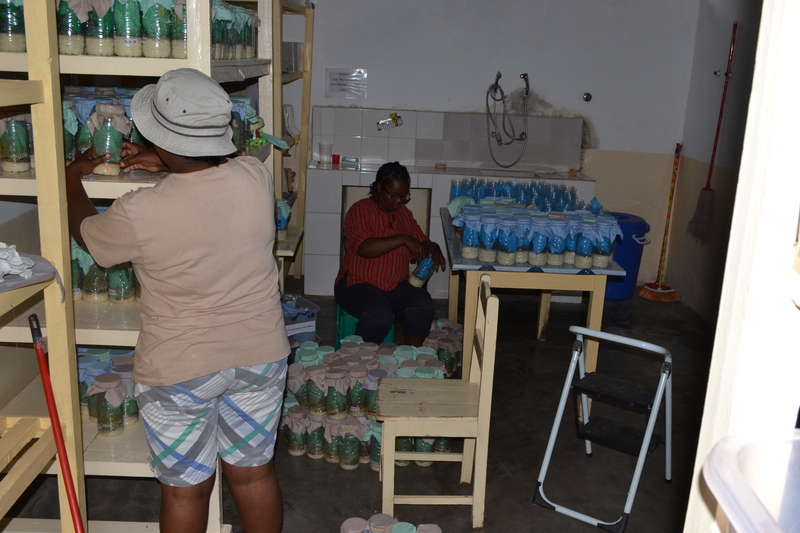 Mitsinjo Breeding Facility, Andasibe – First Time at the Facility. Being my first proper day in Madagascar, I was ecstatic and with all the excitement I was up ready to go at 6.30am hours earlier than was needed! Devin came to meet me for us to walk together on my first day, so I could get my bearings and know my way around the village and road towards the facility. I remember walking through the town and noticing every little detail around me, from the smell to the sights that surrounded me but the one obvious thing was that I was the new guy in town. Let’s just say that I learnt the common Malagasy greeting incredibly quickly, I had to say it to everyone, out of politeness but also because I wanted to be friendly! 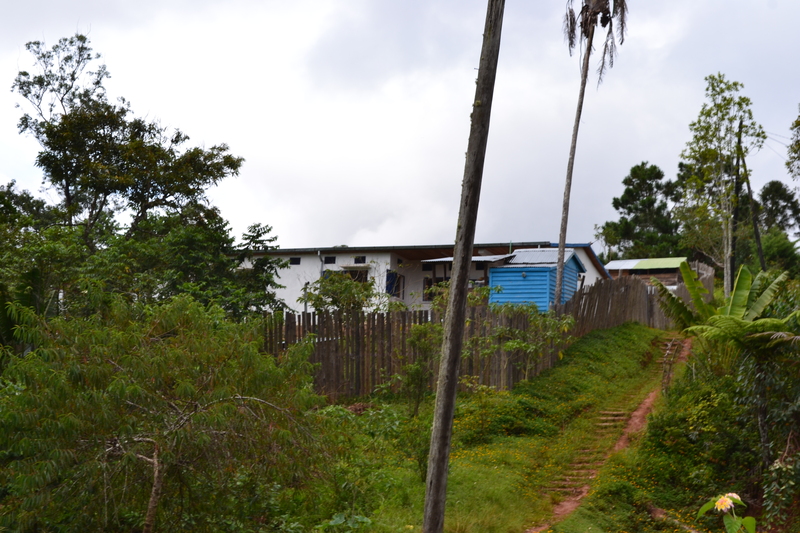 On our way out of the edge of town, on the main road that takes you towards the National Parks, I noticed an extremely well preserved (Almost new-like) building with big capital letters on the sides of it stating “ANDASIBE”. I asked Devin exactly what the place was and why it appeared abandoned when it looked so new, well it turns out I actually knew this building, as a hotel from reading about Sir David Attenborough’s adventures in the 60’s. 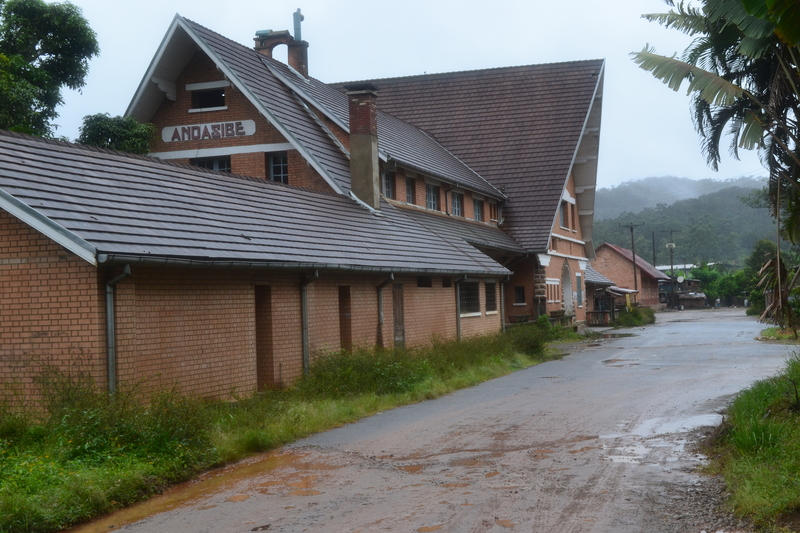 This was the Andasibe Train Station Hotel, and it had accommodated quite a few celebrities including Gerald Durrell, Prince Phillip and of course Sir David. Devin reminded me that the corner (directly where a restaurant now sits – where I eat most the time) as Sir David described, had rainforest right outside his window with Diadem Sifaka amongst the trees, a disturbing thought considering that the rainforest had disappeared so much since then. After a 45 minute walk and a struggling uphill climb to the facility, which just proved how unfit I had became, we arrived at the Mitsinjo Breeding Facility, something I was eagerly waiting to see for well over a year. The first thing you notice about the building, once you open the gate, is the vast amount of logos from various organisations across the world that support the project, it truly was an impressive and fantastic sight to see, all except on of the logos (which I will explain later on). We entered and already I was impressed with the protocols and procedures we had to go through before even entering the facility! Provided for the staff members, volunteers, PhD students and Researchers, are either Foam Crocs or Wellington Boots that are just for use within the facility main building. Your clothes must be clean before you are allowed to enter also, so no patches of mud (Luckily, I fully disinfected my clothes prior to leaving the UK using Virkon and Anigene) just incase a lethal pathogen maybe present upon your person. I was extremely excited and full of anticipation to actually just get in and view the facility and the legendary and highly important wild caught founders of the Golden Mantella (Mantella aurantiaca) species. As I entered finally, straight away I was presented with a vast quantity of Fruit Fly (‘SiSi’ in Malagasy), Spring-tail, Tropical Woodlice, and Crickets cultures, incredibly overwhelming considering the amount I am normally used to. It was impressive, to say the very least! Justin Claude Rakotoarisoa looking after some of the F1 generation wards within the facility. © 2015 – Joshua Ralph – All Rights Reserved. 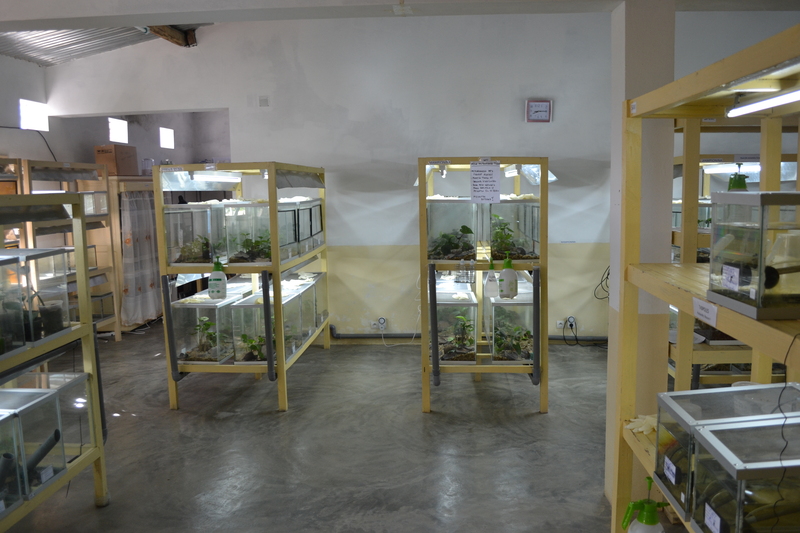 Then we approached a set of heavy wooden doors, allowing access to the frog research and collection room, which is home to over 800 specimens, of 8 different species within the Conservation and Husbandry Research programmes. 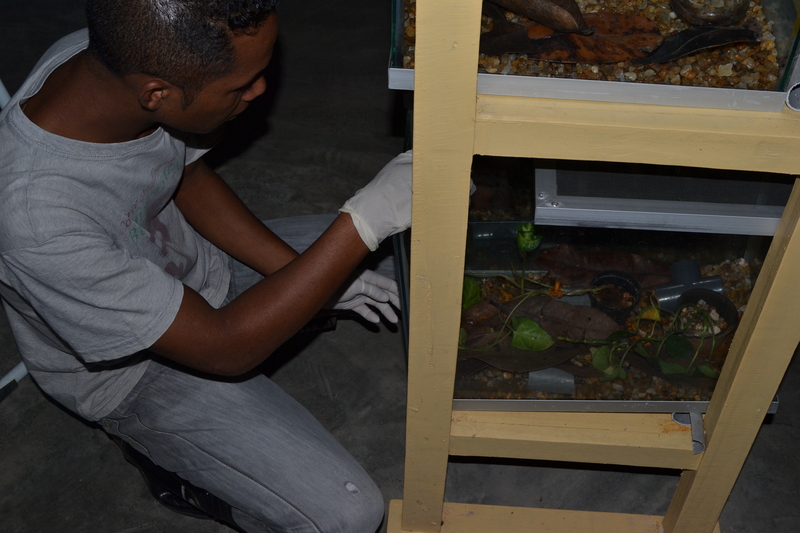 The obvious and main focus of the facility though is the famous and entirely beautiful Golden Mantella (Mantella aurantiaca) specimens, classified as Critically Endangered by the IUCN Red List. However, what makes these particular specimens so important is not as well known of to the outside world, which goes back to one of the logos upon the wall of supporters. The wild caught founders were once found in the Ambatovy locality within the North-western part of the Torotorofotsy Wetland reserve, however a few years previous, it was discovered that this particular area had a vast amount of Nickel within it. 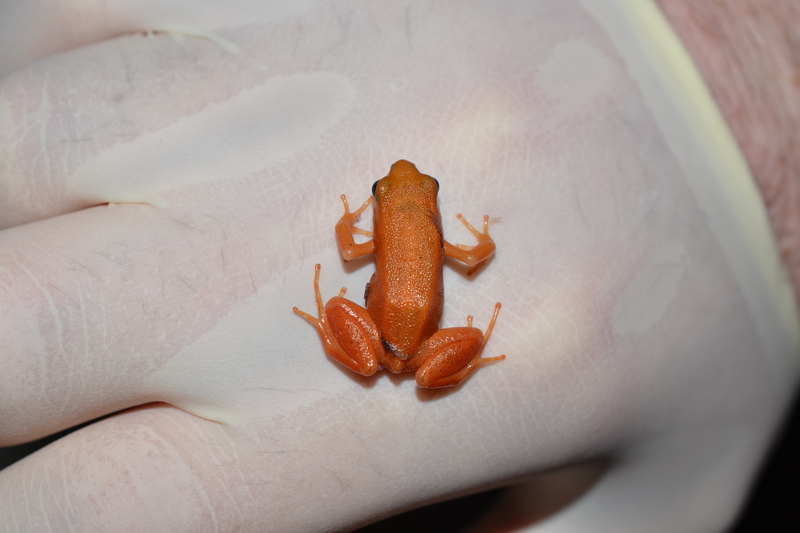 So the Ambatovy Nickel Mining Company got permission to destroy the habitats as long as they contributed and removed the specimens of Mantella aurantiaca from the remaining four ponds and give them to Association Mitsinjo. One of the original Wild Caught founding specimens from the Ambatovy locality of the Torotorofotsy, now found only at the Mitsinjo Conservation Facility. © 2015 – Joshua Ralph – All Rights Reserved. Just like that, the Ambatovy locality was wiped out and declared extinct in the wild (hopefully this may make you think about where the nickel in some of your purchases comes from), these beautiful and remarkable specimens were the last of their kind from the area they should be within.